In a previous paper presented at the annual meeting of the Association for the Study of the Cuban Economy (ASCE), I analyzed Cuba’s economic performance in 1997-1998 (Mesa-Lago 1998) and the present paper continues that tradition. In 1999-2000, the Cuban economy grew at an annual average rate of almost 6% and yet, in 2000, GDP still was one-fifth below the 1989 level. Cuba kept controlling inflation and the fiscal deficit, although the latter slightly rose and the monetary overhang expanded significantly. Gross revenue from tourism, as well as output of oil and nickel, continued to rise and reached record levels, but sugar output was stagnant at less than half the level of the 1980s. Production of several key industrial and agricultural products declined (textiles, fertilizers, milk) or rose and decreased (cement, cigars, fish, rice, eggs), while steady increases occurred in few lines (electricity, citrus); in all these cases, however, output in 1999-2000 was still below that of 1989. The external merchandise trade deficit kept climbing and surpassed the $3 billion mark in 2000, the highest ever, aggravated by low sugar production and high world oil prices. The trade deficit was partly compensated with tourism earnings and remittances from abroad, but Cuba had to resort to costly shortterm loans to cover the difference. The external debt slightly declined to less than $11 billion and a significant increase in cumulative foreign investment was reported albeit related to committed rather than actual investment. Open unemployment kept descending but estimates of underemployment were not available; the real wage slightly increased although still was 40% below the 1989 level. Social security expenditures (mainly pensions) rose to 13% of GDP and will continue to grow as the Cuban population rapidly ages to become the oldest in the region. Infant mortality continued its decline and, in 2000, was 35% below the 1989 level. University enrollment began a modest reversal of the dramatic fall of the 1990s but in 2000 still was 56% below the 1989 level. The large majority of economic and social targets set by the V Party Congress for 1998-2002 has not been fulfilled. Targets for 2001 are more moderate, but two thirds of them will be difficult or impossible to achieve. An interesting debate is taking place among some Cuban scholars on the need to advance reforms further and design a new strategy to give a thrust to growth and cope with the external disequilibria. The economic reform process has been basically halted since 1996, as only two measures were taken in 1997-1998, both of an administrative nature, without a further move to the market: restructuring of the banking sector and promotion of the system of enterprise perfection (sistema de perfeccionamiento empresarial). A Cuban scholar has compiled a comprehensive list of all reform measures taken from 1990 to mid-2001 and there are no such measures for 1999- 2001 (Ferriol 2001). Several tables in this paper summarize Cuba’s major economic and social indicators, as reported by key government institutions such as the Oficina Nacional de Estadísticas (ONE), the Banco Central de Cuba (BCC) and ministries. Additional data come from Cuban scholars (whose academic output has expanded significantly, both in quantity and quality) and the U.N. Economic Commission for Latin America and the Caribbean (ECLAC) based on official data. The series start with 1989, the year before the crisis began, tend to show their worst point in 1993, and recover in 1994-2000 (for a recent analysis of Cuban statistics see Mesa-Lago 2001a). Domestic comparisons are made between 1989 and 2000; international comparisons with Latin America and the Caribbean are also made when possible. The evaluation of performance is divided into four major sections: macroeconomic, external, physical output and labor/social. Growth: Table 1 shows that gross domestic product (GDP) grew by 6.2% in 1999 and 5.6% in 2000, for an annual average of 5.9%, contrasted with an average of 1.8% during the slowdown of 1997-1998. The Cuban average rate of growth for 1999-2000 was the fifth highest in Latin America and the Caribbean, after the Dominican Republic, Belize, Nicaragua and Trinidad and Tobago.2 Except for the latter, which benefited from very high oil prices, these countries are among the least developed in the region, and Cuba suffered a 35-45% decline in GDP in 1989-1993. Cuba’s annual growth rate during the 1994-2000 recovery averaged 3.8%, but for the entire period 1990-2000 it averaged -1.2%, the lowest in Latin America and the Caribbean (ECLAC 2000b). In 2000, Cuba’s GDP level at constant prices of 1981 was 16,556 million pesos (BCC 2001; ONE 2001), 21% below the 20,960 million pesos level of 1989 (ECLAC 2000b; according to BCC 2001, the gap compared with 1989 was only 15%). In 2000, GDP per capita at constant prices, in pesos, was 25% below the 1989 level. At the average growth rate of 1994-2000, it would take six years for GDP to recover its absolute level of 1989 and eight years to recover the per capita level. Capital Formation: Gross capital formation as a percentage of GDP shrunk from 26.7% to 5.4% in 1989-1993, but rose since 1995 and reached 13.2% in 2000, still 51% below the 1989 level (ECLAC 2001 estimates that gross domestic investment averaged 8.4% of GDP in 1997-2000). A Cuban scholar argues that a strong economic recovery would require investment rates similar to those of 1975 and 1989, that is, 25% of GDP (Marquetti 2000). Another scholar also acknowledges the currently low level of investment and that, to increase it, is necessary for GDP to expand at a faster rate, instead of changing the structure of investment/consumption, because the latter cannot be further reduced (Triana 2001). Price Stability: Inflation (based on changes in the consumer price index—CPI) peaked at 25.7% in 1994 and turned into deflation: -2.9% in 1999 and -2.3% in 2000 (BCC 2001). These figures are questionable for four reasons: (1) Cuba has never published information on the methodology for calculating the CPI, including the basket of goods and services used; (2) 1981 has been used for 20 years as a base for constant prices despite foreign criticism because it was an abnormal year (high inflation); (3) the CPI variation (negative) is significantly different from the behavior of the implicit GDP deflator (positive change): 5.2% in 1998, 0.8% in 1999 and 0.1% in 2000 (the latter estimated by ECLAC 2001a); and (4) “monetary liquidity” (monetary overhang) was reduced from 11 to 9.2 billion pesos in 1994-1995 (from 73.2% to 42.6% of GDP), but increased again in 1996-2000 to reach 10.5 billion pesos, 2.5 times the level of 19893 (see Table 2). An intriguing question is how there could have been deflation in 1999- 2000 while the GDP deflator slightly increased and the monetary overhang rose in those two years. The fiscal deficit as a percentage of GDP fell from 33.5% to 2% in 1993-1997, a significant achievement, but rose to 2.5% in 2000, above the regional average of -2.3% (ECLAC 2000b). One important component of the deficit is the fiscal subsidy to inefficient state enterprises (concentrated in sugar and agricultural sectors), that accounts for 18% of total expenditures (Triana 2000). Trade Balance: The major indicators for the external sector are shown in Table 3. After a dramatic decline of 79% in 1989-1993, the value of exports (goods) increased by 61% in 1993-1996, but declined/stagnated thereafter; export value was 1.7 billion pesos in 2000, still 68% below the 1989 level. Imports of goods dropped 75% in 1989-1993 but steadily rose thereafter reaching 4.9 billion pesos in 2000, still 40% less than in 1989. As imports expanded faster than exports, the trade balance deficit of goods jumped six-fold in 1993-2000, reaching the historical record of 3.2 billion pesos, 18% higher than the 1989 deficit. There is a major difference between 1989 and 2000, however, that Cuba does not benefit any longer from generous Soviet automatic long term loans to cover the deficit, at very low interest rates and never paid. Now Cuba has to resort to short-term loans from foreign banks and other financial institutions, which charge high interest (see below). The merchandise trade deficit was partly compensated with a substantial surplus from services, mainly tourism, and yet the current account balance was negative: -462 million pesos in 1999 (1.8% of GDP) and -687 million pesos in 2000 (2.5 % of GDP); these were the two highest deficits since the end of the 1980s. The current account deficit was partly compensated with “net transfers,” mostly remittances from Cubans abroad; such transfers rose from zero in 1989 to 799 million pesos in 1999 and 842 million in 2000. But payments of debt principal and interest, combined with profit taking by foreign investors, added to the negative balance: -514 in 1999 and -693 million pesos in 2000 (BCC 2000, 2001; for statistical series on Cuba’s balance of payments see Pérez-López 2000). Terms of Trade: There was a significant steady deterioration in the terms of trade in 1989-2000 (-50 percentage points). In 1999, the price of sugar in the world market dropped one-third while the price of oil jumped 2.5 times provoking a 18.3% deterioration in the terms of trade (BCC 2000). In 2000, rising oil prices cost $500 million more for a similar volume of oil imported in 1999, and higher prices of sugar and nickel did not compensate for the high oil prices, leading to a 22% deterioration in the terms of trade (BCC 2001). In October 2000, however, Cuba signed a trade agreement with Venezuela, which might help to improve the terms of trade (in 1999 Venezuela was Cuba’s fourth trading partner, ahead of Russia, and jumped to first place in 2000). Under this agreement, the island will receive 53,000 barrels of oil daily, equivalent to 2.5 million tons annually, meeting 29% of domestic needs (8.6 million tons). About 80% of the imports will be paid at world prices within 90 days; the remaining 20% will be paid in 5 to 20 years, based on the average annual price of oil in that period, and one-fifth of that with Cuban services and goods (Rodríguez Castellón 2001). Trade Composition: Export concentration on sugar steadily decreased from 73.2% to 31.8% of total export value in 1989-2000 as a result of the fall in sugar export quantum and value. And yet, although all other export shares increased in 1989-1999 (nickel, tobacco, fish, citrus, rum), their actual value—and in most cases also volume—shrunk, except for cigars and cement.4 The composition of imports showed some important differences between 1989 and 1999 also: the share of food, fats and beverages rose from 13% to 19% and of manufactures from 14% to 26%; meanwhile, the share of imported machinery/ transportation equipment decreased from 31% to 26%, and the share of fuels sank from 32% to 17% (CCE 1991; ONE 1999 and 2000). These trends are clear indicators of both Cuba’s decreasing self-sufficiency on food and of the de-industrialization process. Trade Partners: In 1989, about 79% of Cuban total trade was with the Soviet Union and Eastern European countries but, after the collapse of the socialist bloc, the island has significantly diversified trade partners. In 2000, the main partners were: Venezuela (13.9% of trade, an increase from 8% in 1999), Spain (13.4%), Canada (9%), Netherlands (8.3%), China (7.6%), Russia (6.7%, a decline from 65% with the Soviet Union in 1989), Mexico (5.1%), France (5.1%) and Italy (4.8%) (BCC 2001). Cuba is the only country in Latin America and the Caribbean that has not reached full membership in any of the regional commercial associations (CACM, CAN, CARICOM, MERCOSUR) and has been excluded from FTAA negotiations. In 2000, Cuba entered the Asian, Caribbean and Pacific group (ACP) and, based on this, could become a member in the Cotonou Accord and receive aid from the European Union (EU). Cuba did not comply with the EU conditions on human rights and, when the EU countries voted against the island at the U.N. Commission on Human Rights, Cuba decided not to sign the accord. The island has gained observer status in CARICOM but trade with member countries is minuscule (León 2001). The U.S. embargo on Cuba was slightly mollified by allowing the island to buy food, but the Cuban government rejected this action due to the lack of credit facilities. External Debt: The hard-currency external debt jumped from $6.2 to $11.2 billion in 1989-1998, and slightly declined to $11.1 billion in 1999 and $10.96 billion in 2000, because of the depreciation of currencies that make up most of that debt in relation to the U.S. dollar. About three-fourths of the debt has matured and has not been paid (BCC 2001). In 1986, Cuba suspended payments of the debt and in spite of several efforts to renegotiate its government debt with the Club of Paris, as of July 2001 there was no an agreement with the Club, hence, Cuba has not received fresh loans. The debt with Russia and the former socialist countries of Eastern Europe, as well as the extinct Council for Mutual Economic Assistance (CMEA), has not been paid, and Cuba has not reached an agreement on the sums to be reimbursed either, allegedly because “they are not convertible in hard currency … and those countries unilaterally did not fulfill the terms and conditions of that debt” (BCC 2001, p. 38). Negotiations with creditors in the United Kingdom, Belgium and Japan resulted in agreements in 1999- 2000. In 1999, 80% of imports were financed with external loans, 70% with maturity of one year or less, and high interest rates, which imposed a heavy burden on the island’s finances (BCC 2000). One-year loans from foreign banks were received in 1996-1997 to finance the sugar harvest (about $500 million), but the cost was quite high, and the net gain from a declined sugar production was lower that the amount of the loan plus interest. The crop failure of 1997 led to less foreign credit available for 1998, the situation improved with a slightly larger harvest in 1999-2000 ($500 million in credits were obtained), but deteriorated with the poor harvest of 2001 (Mesa-Lago 1998; Triana 2000). In that year Cuba defaulted on obligations with france, Spain, South Africa, and other countries (Frank 2001b). Foreign Investment: Cumulative foreign investment since 1990 was officially reported at $2.1 billion by 1995 and $2.2 billion by 1998, virtually stagnant in three years. But it was given as $4.3 billion at the end of 2000, a surprising two-fold increase in two years, explainable because it referred to committed rather than actual investment. Other estimates of foreign investment vary wildly, according to divergent definitions, for instance: $1,352.6 million in “direct foreign investment” in 1999 (Pérez Villanueva 2000); more than $4 billion in “committed investment” in 2000 (Ferriol 2001), and $5 billion in “total capital involved” in 2000 (Triana 2001). In spite of the significance of this item, there are not reliable statistics available. Exchange Rate: The official exchange rate of the peso to the dollar continued to be par, but the state exchange houses (CADECA), established in 1995, use a more realistic exchange rate. The latter, in pesos per one dollar, deteriorated from 7 to 95 in 1989- 1994, steadily appreciated reaching 19 in 1996, deteriorated again to 23 in 1997, and appreciated to 20 in 1999 but slightly deteriorated to 21 in 2000 (ECLAC 2001a). Some Cuban scholars argue that maintaining the artificial parity with the dollar is harmful for the Cuban economy and advocate for convertibility based on the market (see last section of the paper). Tourism: The number of tourists visiting the island rose from 270,000 in 1989 to 1,774,000 in 2000, and gross revenue jumped ten-fold, from 168 to 1,940 million pesos in the same period. The problem is that data on the cost of imported inputs, which must be deducted from gross revenue to calculate net revenue, are not officially published. Table 4 is an attempt, admittedly speculative, to calculate the cost of imported inputs in 1992-2000 based on rough estimates given by Cuban scholars in some years. According to Table 4, net revenue increased from 99 to 1,182 million in the period 1992-2000, but these estimates are debatable. For instance, the 2000 figure is based on a statement from the Central Bank in the sense that 61% of inputs for tourism were produced domestically, implying that 39% were imported (BCC 2001, p. 25), but that does not mean that the total cost of imported inputs was 39%. The Minister of Tourism, Ibrahim Ferradaz (cited by Muñoz 2001) has clarified that, in 2000, “the cost per dollar of revenue [in the tourist industry] was 0.78 cents … about the same as in 1999.” If this is correct, then the cost of imported inputs in 1999-2000 was not 39% but 78%, and net revenue in those years should be 418 and 427 million pesos, respectively. A Cuban scholar warns that the tourist sector is a grand importer and that the country must work in producing some of the inputs needed in that industry, otherwise, with the planned expansion, Cuba would have to import $3,000 billion—equivalent to the 2000 merchandise trade deficit (Pérez Villanueva 2000). Other two problems faced by the industry are: (1) the occupancy rate in international tourist rooms climbed from 39.7% in 1990 to 59.7% in 19995 (ECLAC 2000; BCC 2000), still low by international levels, hence, raising the question of how the added rooms will be filled; and (2) average expenditures, overnight stays at hotels and receipts for visitors have declined since 1994-1995 (Espino 2001). The performance in terms of physical output of key products (export products, energy, food and manufactures) is presented in Table 5. Except for oil and nickel, production of all of the key products was lower in 2000 than in 1989. Nickel: Nickel output decreased 43% in 1989-1994 but, with the help of Canadian investment, surpassed the previous production peak in 1996 and kept rising thereafter. Output in 2000 was 51% above the 1989 level. There are three plants in operation: René Ramos Latour (formerly Nicaro, built with U.S. investment and technology), Pedro Soto Alba (formerly Moa, built with U.S. investment and technology) and Ernesto Che Guevara (built with Soviet technology and financial aid); a fourth plant, at Las Camariocas, has not been completed. In 1989 the installed capacity of the three operating plants were: 22,500, 24,000 and 30,000 tons, respectively, for a total of 76,500 tons. Production in 1989, however, was only 47,000 tons, because the Che Guevara plant was just starting and it consumed much energy, while the two former U.S. plants needed modernization (Mesa- Lago 2000). Production in 2000 was as follows: 10,708 tons by the Ramos Latour plant (it was said that production capacity was 10,000 tons, less than half the 1989 level), 29,700 tons by the Soto Alba plant, and 31,000 by the Che Guevara plant, for a total of 71,400 tons. Current production, therefore, is below the installed capacity of 1989, in spite of investment by Sherritt International Corporation. In 2000, the Che Guevara plant used half of the fuel it did in 1990, but still had high fuel consumption (BCC 2001; Portal 2001). Oil: Oil extraction peaked at almost one million tons in 1986, declined by 44% in 1987-1991, rose in 1992-1995, was stagnant in 1996-1997, and rapidly expanded in 1998-2000, to reach a record of 2.4 million tons (other estimates give 2.6 to 2.8 million tons). 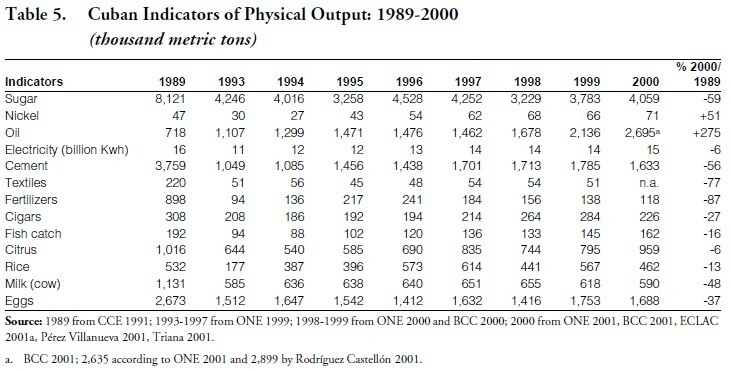 Output in 2000 was 234% above 1989, and 140% over 1986. This impressive performance has been the result of $450 million in foreign investment, two-thirds of total investment in this crucial sector (Triana 2000). About 42.3% of Cuba’s total energy needs are met with domestic sources, mainly bagasse (25%) and crude oil (17%); the contribution of natural gas and hydroelectric power is minimal (0.3%). Imports cover 58.4% of needs, 46% from oil derivatives and a 12% from crude oil (Rodríguez Calderón 2001). The contribution of domestic output of crude oil to total crude oil and derivative needs was 22.7% in 1999, up from 11.6% in 1987 (Mesa-Lago 2000). The increase in domestic oil production has reduced foreign energy dependency by half of what it was a decade ago, but it still is 77%. Sugar: At least until 1999, sugar was the main source of export revenue, although nickel was rapidly closing the gap. The tight relationship between sugar and GDP has been shown by Triana (2000), but this vital sector has been unable to recover: “The sugar industry has gone through a depressive state and its performance decides the rhythm and dimension of the process of economic recovery” (Marquetti 2000, p. 11). The Minister of the Sugar Industry, General Ulises Rosales del Toro, blamed the climate (a draught) for the failure, but other factors were responsible. Annual average sugar output (in million tons) steadily declined in the last two decades: 7.8 in 1981-1985, 7.6 in 1986-1990, 5.2 in 1991-1995, 3.9 in 1996-2000 and 3.5 in 2001 (Mesa-Lago 2000, and Table 5). The total sugar cane area sown declined by 22% in 1990-1999, from 1.76 to 1.38 million hectares, while the irrigated area decreased from 22% to 9% of the total area sown. The agricultural yield per hectare sank from 60 in 1989 (59.4 in the state sector and 62.8 in the non-state sector) to 34.1 in 1999 (31.5 and 34.4 in the state and non-state sectors, respectively). Weeds cover from 10% to 15% of the sown area and there is a severe scarcity of herbicides. Due to a decline in domestic production, as well as imports, the use of chemical fertilizers has decreased and has been partly replaced with natural fertilizer. Because of insufficient fuel, most of the transportation is done with animal traction and that, combined with the lack of spare parts, has reduced the number of cane cutters in operation and the capacity of the sugar-cane cleaning centers (CCE 1991; ONE 1991, 1999, 2000; Orrio 2001). Finally, the sugar industrial yield has steadily fallen under the Revolution: from 12.5 in 1961-1965, to 11.0 in 1981-1985, 10.7 in 1986-1990, and 10.6 in 1996-2000 (Mesa-Lago 2000; ONE 2000). Manufacturing: Five key manufactured products have been selected for the analysis of performance; these products played a key role in Cuba’s industrialization process before the crisis, mainly for domestic consumption but also for export. For all of them, output drastically shrunk in 1989-1993 and rose thereafter, but output in 1999-2000 was still below the 1989 level: -6% for electricity, -27% for cigars, -56% for cement, -77% for textiles, and -87% for fertilizers. Several factors have contributed to this negative performance: scarcity of fuel, lack of spare parts (most Cuban factories were built and equipped by the Soviet Union and Eastern European countries, which no longer supply those parts), difficulties to acquire needed inputs abroad, and absence of foreign demand (except for cigars). According to Marquetti (2000), the level of decapitalization and technological obsolescence in various industrial branches is 30%. Fishing: Fishing was one of the major economic successes of the Revolution but its problems actually began before the crisis. The catch peaked at 244,000 tons in 1986 and by 1989 had declined to 192,000 tons; the crisis reduced it to 88,000 in 1994, and there was a slow increase in 1995-2000 to 162,300 in 2000. Output in the latter year was 16% below the 1989 level and 34% below the 1986 peak. Agriculture: The non-sugar agricultural sector (both for domestic consumption and export) has had a poor performance and its recovery has been sluggish and unsteady; thus, in 2000, output was below the 1989 level in the following key staples: -48% for milk, -37% for eggs, -13% for rice and –6% for citrus. Similar declines occurred in other fruits and tobacco leave. Conversely the output of vegetables, tubers, corn and beans increased but, in per capita terms, output was either stagnant or lower (CCE 1991; ONE 1999, 2000, 2001; BCC 2001; ECLAC 2000a). The number of cattle heads peaked at 6.8 million in 1967 and sank to 4.6 in 1993, stagnated in 1994-1998, and decreased to 4.4 million in 1999; there were 0.83 heads per capita in 1967, 0.46 in 1989 and 0.39 in 1999. The decimation of cattle led to the fall in beef output from 289,000 tons to 152,000 tons, as well as in milk production (Mesa- Lago 2000; ONE 1999, 2000). The third agrarian reform introduced in 1993-1994 has been unable to solve the problems in agriculture, such as inefficiency and lack of incentives. The new cooperatives (UBPC) are highly dependent on the state, who in practice directs production and buys virtually all of their output at prices set below the market price, hence, creating serious disincentives. As a result, in 1997, the UBPC’s share of cultivated land was 57.6% but their share of total sales in the free agricultural markets was 3.6%; conversely the private sector shares were respectively 16.9% and 72.7%. In 1995-1996, 94% of UBPCs suffered losses and required state subsidies; by 1999-2000 the proportion had been reduced to 37%, still a high percentage. Another problem is the increasing size of the UBPCs, which makes them more difficult to manage. The UBPCs operate 74% of sugar cane plantations, which largely explains the failure of this sector. Finally, total cultivated agricultural land decreased by 13% in 1990-1997 (ECLAC 2000; Novoa 2001). Unemployment: Table 6 selects five key labor and social indicators of performance. Open unemployment was reduced from 7.9% in 1989 and 1995 to 5.8% in 2000, a decline of 26% (BCC 2001 gives a rate of 5.5% in 2000). The “equivalent unemployment rate” (open unemployment plus displaced workers receiving compensation), estimated by ECLAC (1998, 2000 a), peaked at 35.2% in 1993 but decreased to 25.1% in 1998 (the latest year available). The question is how this feat was accomplished when in 1995 from 500,000 to 800,000 workers in the state sector were considered surplus (disponibles) 7 and should have been dismissed, and the small private sector is stagnant under increasingly tight regulations and taxes. Some measures taken in 1996-2001 against self-employment and other private sector activities are: (a) 300% increase in licenses and 650% in fees to the self-employed; (b) taxes of $850 monthly for tiny restaurants (paladares) and $250 for a room rented in tourist areas (fines of $1,000 to $1,800 per guest are imposed for rental violations); (c) halting new licenses for paladares; (d) prohibiting private taxis to transport tourists; (e) closing of independent private galleries, allowing only state galleries to sell art work; and (f) a tax of 300 pesos on “video saloons” and of 800 pesos for rental of dresses (Bauzá 2001; Cawthorne 2001; Henken 2001). These measures led to a decrease in the number of registered self-employed workers from 208,500 at the end of 1995 to 156,600 in 1999 (ECLAC 1998; ONE 2000). Minister of Economy José Luis Rodríguez has declared on this issue: “It is not our policy to eliminate self-employment … But we do not stimulate it because we do not believe it is the way to get the country out of its economic difficulties” (cited by Cawthorne 2001). A draft law circulating in 1995, which allowed Cubans to own and operate small business, went into limbo and has not been discussed in the last three years. Real Wages: Table 7 presents two indices of real wages in 1989-1999, converted to the year 1989 as a base: Togores’ index indicates a decline of 42%, while ECLAC’s index exhibits a decrease of 39%. The small wage increase in 1999 did not raise the purchasing power, because of the high prices in dollar shops and agricultural markets (prices in the latter did not change in three years, and rose in 2001). The lack of connection between wages and real prices is a disincentive to labor productivity and an obstacle for the improvement of population consumption (Triana 2000). A survey undertaken in 1999 by the Instituto Nacional para la Salud de los Trabajadores detected an increase of 41% in workers’ discontent (Garve 2001). Social Security: The cost of social security (combining pensions, health care and social assistance) has been climbing as a result of several factors: virtual universal coverage, very low ages of retirement, the maturity of the pension scheme, and the aging of the population (it is estimated that, by 2025, Cuba will have the oldest population of the region and there will be only two persons of productive age for one person of retirement age). Table 6 shows that social security expenditures as a percentage of GDP peaked at 15.8% in 1993, because GDP decreased by 35% while social security expenditures kept rising. As GDP began to increase again, the proportional burden of social security declined and stabilized at about 12.2 % of GDP in 1995-1998 but, because social security expenditures expanded faster than economic growth, such burden rose to 13% in 1999-2000 and should continue growing in the future. Furthermore, there is an expanding deficit in the pension scheme, which is covered by the state (38% of total expenditures and 2.6% of GDP in 1999) and all health care is financed by the state (5.5% of GDP in 1999). The real average pension declined by 42% in 1989- 1998 and the average monthly pension of 104 pesos in 2000 was equivalent to $5. The rationing system only provides food rations for one-third of the month (for about 25 pesos); other food and essential consumer goods must be bought with the remaining $4 in dollar shops and in the agricultural markets, where prices are very high (Mesa-Lago 2001b). The government is considering a significant reform of the pension scheme that may increase the age of retirement, implement workers’ contributions and incorporate the growing private sector (Gutiérrez and Peñate 2000). Health: The infant mortality rate continued to fall: it decreased from 11.1 (per 1,000 born alive) in 1989 to 6.4 in 1999, although it rose to 7.2 in 2000, for a decline of 35% over the period (Table 6). That rate was the lowest in Latin America and the Caribbean (BCC 2000). Morbidity rates for eleven contagious diseases in 1994-1999 showed increases in six (chicken pox, hepatitis, syphilis, gonorrhea, tuberculosis and typhoid), continuous non reported cases in five (diphtheria, malaria, measles, polio and tetanus), and no decreases (ONE 1999; MINSAP 2000). Data on nutrition are extremely difficult to find, but the United Nations Development Program (UNDP) shows the following changes in 1970-1997 in daily per capita supply: calories -6%, protein -23.9% and fat -27.7% (UNDP 2000).8 The number of physicians increased almost two fold in 1989-1999, and in the latter year Cuba had the highest proportion of physicians to population in the region: 58.2 per 10,000 inhabitants (MINSAP 2000; ECLAC 2000a). Actually there is a surplus of these professionals: “We are sending thousands of physicians free to provide their services … in Latin America, the Caribbean and Africa. This is possible because of our abundant human resources” (Castro 2000). Thousands of physicians work as taxi drivers, waiters in tourist facilities and other occupations where they can earn dollars, thereby earning several times the salary paid in their profession. Education: University enrollment steadily diminished in 1989-1998, with a small increase in 1999, for a 56% decrease in the period (Table 6). The percentage of the population in the cohort age of higher education fell from 21% in 1989-1990 to 12% in 1998-1999, and while in 1993-1994 there were 31,105 graduates at that level, the number dropped to 10,706 in 1998-1999 (ECLAC 2001b; Orrio 2001). Two main reasons for these declines are: the lack of incentives for university graduates, who are unable to find jobs in the state sector and are prohibited from practicing their professions as self-employed, and reduced quotas for university enrollment set by the government. Distribution: A survey of the economic conditions of households in the city of Havana in March 2000 had the following findings: (a) the average income per capita was 198 pesos ($9.90 at the unofficial exchange rate); (b) 53.4% of households had a per capita income between 50 and 150 pesos ($2.50 to $7.50) and 14% less than 50 pesos; (c) 77.9% of food expenditures were in agricultural and private markets; and (d) 77.2% declared that their income was insufficient to cover expenditures (Oficina Territorial de Estadísticas de la Ciudad de La Habana, Encuesta sobre la situación económica de los hogares, cited by Pérez Villanueva 2001). In a previous paper I reported that inequalities had significantly expanded in the 1990s (Mesa-Lago 1998). Rationing has extended to all consumer goods but ceased to be a significant equalizer because the monthly rations cover less than two weeks of the minimum food requirements; the rest has to be bought in state dollar shops or in the agricultural and black markets, at very high prices, affordable only by those who earn or receive hard currency from abroad. Finally, there is a significant concentration in bank accounts: 12% of such accounts have 80% of the total deposits (5.3 billion pesos) and new banking accounts earning as much as 7% interest will increase such concentration (Triana 2000). Housing: “Housing is recognized as the gravest social problem affecting the nation … the accumulated needs [housing deficit] are substantially higher than new housing construction, among other reasons because of the deterioration of the existing stock” (Triana 2000, p. 10). In the city of Havana the situation is particularly difficult: in 1999, out of 575,795 housing units only 57% were in “good shape” and the remaining 43% were “so-so” (regular) or in “bad shape”; the situation was worse in some poor neighborhoods (for instance, old Havana), where 75% of the dwellings were ranked as so-so or bad. In the survey cited above, 59.3% of the households reported construction problems and, although 98.3% had piped water, only 49.8% received water daily (Pérez Villanueva 2001). The V Congress of the Cuban Communist Party, held in October 1997, set very ambitious targets for the five-year period 1998-2002 (Mesa-Lago 1998). I contrast such targets with actual performance in 1998-2000 as follows: (1) GDP growth at an annual rate of 4% to 6% (it was 4.3% in 1998-2000); (2) sugar output increase to 7 million tons (actually 3.6 million in 1998-2001); (3) nickel production increase to 100,000 tons (output in 2000 was 71,400 tons, close to installed capacity); (4) tobacco leaf output increase to 50,000 tons (output in 1999 was 30,562 tons); (5) two million tourists and gross tourism revenue of $2.6 billion (there were 1.7 million tourists and $1.8 billion in revenue in 2000); (6) oil needs met with increasing domestic production and savings from conservation (the domestic contribution to total oil supply was less than 23% in 1999); (7) 50,000 dwellings built annually (43,000 dwellings were built annually in 1998-2000); and (8) state pensions supplemented with individual savings accounts and life insurance (none of the two have materialized). None of these targets had been achieved by 2000 and, with the exception of tourism, they probably will not be met by 2002. The VI Congress of the CCP is scheduled for 2002; it will be interesting to see if the party evaluates the targets set by the V Congress. • 10% in non-sugar agriculture (difficult to accomplish; agriculture as a whole, including sugar, grew at an annual rate of 4% in 1997-2000). In addition, the system of enterprise perfection, which was introduced in 1998 is planned to be fully implemented by the end of 2001 but, by the end of 2000 only 50 of 3,000 enterprises had such system in operation (Carranza 2001) and, by mid-2001, only 133 enterprises had been “approved to establish the system” (Ferriol 2001). No targets have been set for inflation, monetary overhang, other production lines and in the social area (targets from Rodríguez 2000; BCC 2001; Triana 2001; background data from ONE 1999, 2000, 2001; Frank 2001a). In the first half of the 1990s there was a lively debate in Cuba on alternatives for economic reform that was abruptly halted in mid-1996. In 2000-2001 there has been a modest revival of the analysis of economic problems and proposals for reforms. Limitations of time and space do not allow a thorough examination herein of all existing positions, hence, this section summarizes the views of five Cuban economic scholars: Carranza (2001), González (2001), Marquetti (2000), Monreal (2001), and Triana (2000). All of them praise the progress achieved, some explicitly reject neoliberalism, and virtually all express the need to work within a socialist framework. Although there are logical differences among them, the essential thrust in their identification of current problems and key guidelines for solutions is fairly similar. I have tried to faithfully translate and abridge the views of those scholars but am fully responsible for any misinterpretation of their views. First I will summarize their views on the problems and then the proposed solutions. • real wages have declined, and there is disguised unemployment, stratified income and significant concentration of bank deposits in a minority of the population (Triana, Carranza). Suggestions for Change: The partial modification of the economic structure in the 1990s was unable to transform it to the needed degree required to promote development within the current international context. The economy cannot grow, as prior to 1990, based on a model of extensive accumulation and low efficiency, only viable then because of the economic support from the Soviet Union and the socialist countries. It is unavoidable, therefore, to have a rigorous debate on the alternatives to cope with the effects of the crisis and to accelerate its solution through a more logical and viable development strategy (Carranza). There is a view that the slowdown of 1997-1998 was the outcome of the “relative paralysis” of economic reform (Marquetti). Overcoming the current crisis requires a model of intensive accumulation and higher efficiency, and this is only feasible with a “fundamental restructuring of the economy” and the completion of the economic reform with adequate coherence. The first decade of the 21th century is the time to face this challenge (Carranza, Monreal). • markets should be of buyers instead of sellers in order to promote competition, hence, reducing prices and improving quality; there must be more decentralization in management; the domestic economy must be adapted to the external adjustment and move progressively to the convertibility of the peso (González). I conclude this paper in the same way my previous one ended, recommending: open up the economy further; facilitate the expansion of the private sector; transform the UBPCs into real cooperatives, autonomous and with more incentives to increase production and profitability; allow university graduates to practice their professions as self-employed and authorize Cuban citizens and groups of workers to manage small and medium businesses, hence, creating enough jobs in the non-state sector to permit the dismissal of non-needed workers in the state sector; complete the banking reform and implement a comprehensive price reform; create a domestic capital market; allow foreign enterprises and joint ventures to hire, promote and pay their employees directly; establish a truly convertible peso; introduce a progressive income tax and workers contributions to social security and reform the pension scheme; and devise a social safety net to protect the most vulnerable groups of the population. 1. The author is grateful for the help given by the following people: his research assistant at the University of Pittsburgh, Jorge Gorostiaga, in formatting the statistical tables; Jorge Pérez-López for the supply of valuable statistical materials; Ernesto F. Betancourt for the ASCE Clipping Service and answering several queries; and Sergio Díaz-Briquets, María Dolores Espino and Francisco León for comments. 2. The BCC (2000, 2001) compares selected Cuban socioeconomic indicators, when they are favorable to Cuba, with those in Latin America: GDP growth rates, inflation, fiscal deficit, infant mortality and open unemployment. 3. As a percentage of GDP, however, the monetary overhang was reduced to 37.9% (contrasted with 21.6% in 1989), but Triana (2001) notes that it excludes circulation in dollars, hence, the percentage should be higher. 5. A different series gives the occupational rate of all tourist establishments, rising from 57.9% in 1993 to 76.1% in 1998, declining to 71.7% in 1999 and increasing to 75.5% in 2000 (ONE 2000; BCC 2001). 6. In per capita terms the decline was from 0.76 tons in 1989 to 0.31 tons in 2001, the latter was half the per capita of 1943: 0.60 tons. 7. According to a Cuban scholar, there were only 120,000 disponibles in 1996 and their number had been reduced to 12,000 by the end of 1999 (Triana 2000). 8. For two contrasting views on Cuba’s human development see CIEM 2000 and Castañeda 2000. 9. Conspiring against this target are: the world economic slowdown, the devaluation of Canadian and European currencies, the continued crisis in Japan, high prices of oil which add to the cost of air transportation, the 10.7% decline in German tourists in the first quarter of 2001, very high construction cost in the tourist industry, etc. (Barrio 2001).